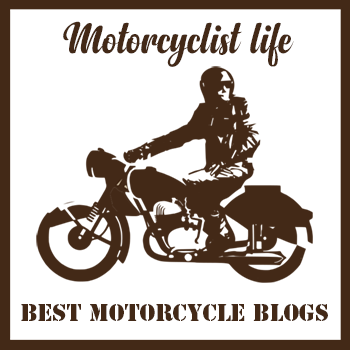 Life on two wheels: Eureka!!! Toronto is not Montreal. I suppose that's painfully obvious, and it's a really good thing that that's the way it is. If Toronto were just like Montreal, that would mean be one less place worth visiting, and how sad would that be? 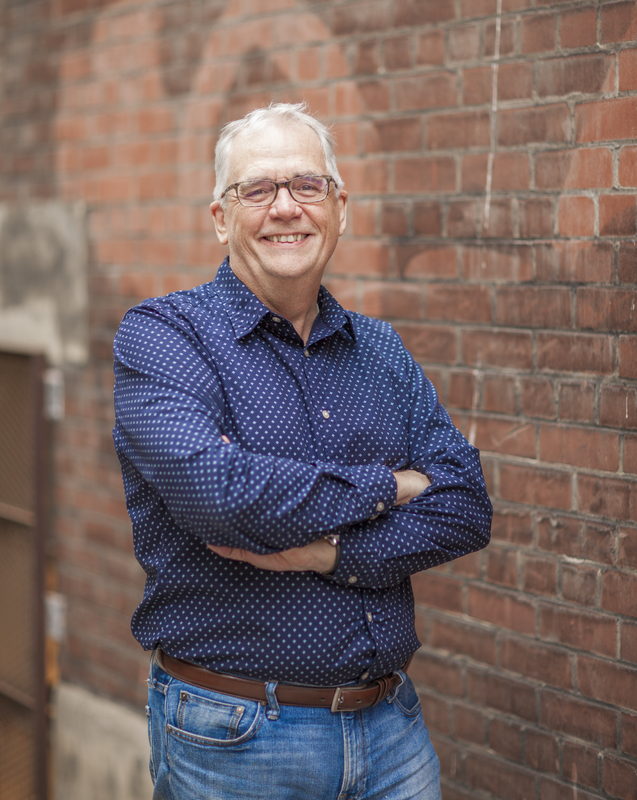 Wouldn't it be great though, if a passionate ex-Montrealer could get some really good Montreal comfort food in Toronto? That's how I came to my quest to find Montreal smoked meat in Toronto good enough to justify going out of my way to get it. A wiser more realistic person (not to say a pessimist) probably should have said to themself "if you really want good smoked meat, GO TO MONTREAL!" But I'm not one to give up quite so easily. 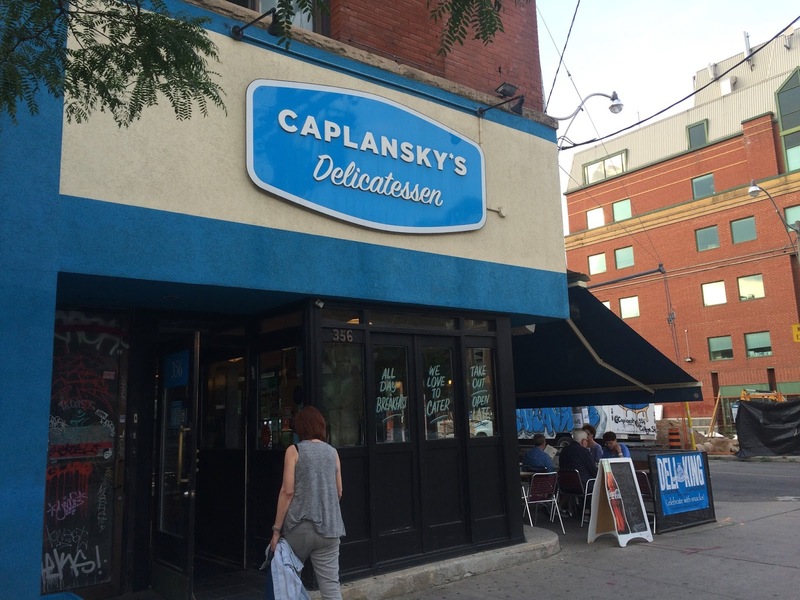 That's why Susan and I headed to Caplansky's Delicatessen. 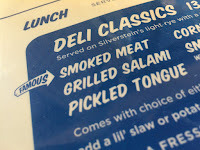 When my smoked meat sandwich came, two things became instantly clear to me. For one thing this smoked beef brisket sandwich wasn't close to being what Montrealers know as smoked meat. Why? Well the texture of the brisket was wrong. Smoked meat is much more delicate and tender. Like most slow cooked brisket, it can barely support its own weight once sliced. It naturally forms a mound of goodness on the bread. 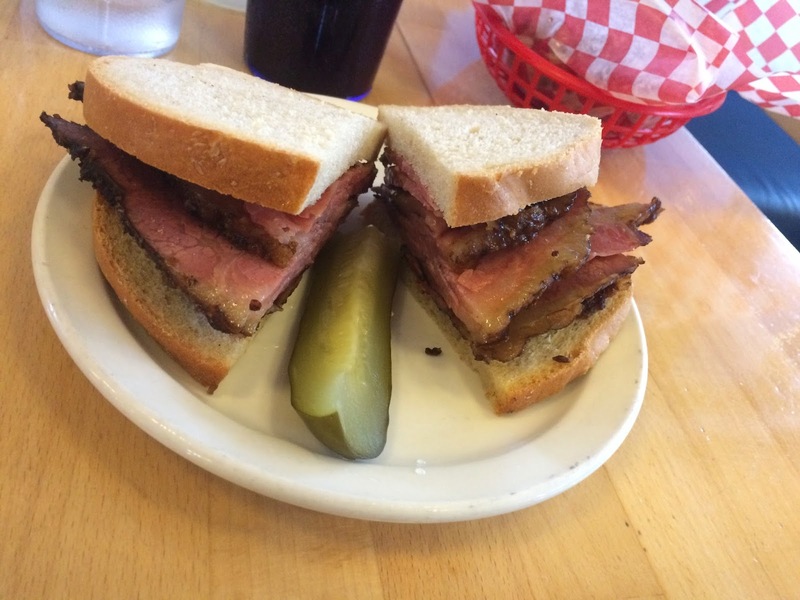 Caplansky's brisket is much leaner than Montreal smoked meat. It has a firmness so it just doesn't sit right on the bread. What that means is that it won't impart that heavenly feeling you get when you wrap your lips around it and sink your teeth in. This is by no means a bad thing, it just means that right off, if you are looking for Montreal smoked meat, you know in the instant that the plate hits the table that this is not it. The second thing that is also obvious to the connaisseur of Montreal's iconic sandwich, is that Caplansky's smoked brisket is definitely not 'Montreal-style regular or old-fashioned smoked meat'. I explained this in the earlier post on the Centre Street Deli. Most Montreal-style smoked meat, and that includes the majority of the smoked meat on menus in Montreal, and elsewhere in Canada, is a mass-produced commercial preparation that pales when compared to the really good specimens that are hand-made in smaller batches by the deli itself. 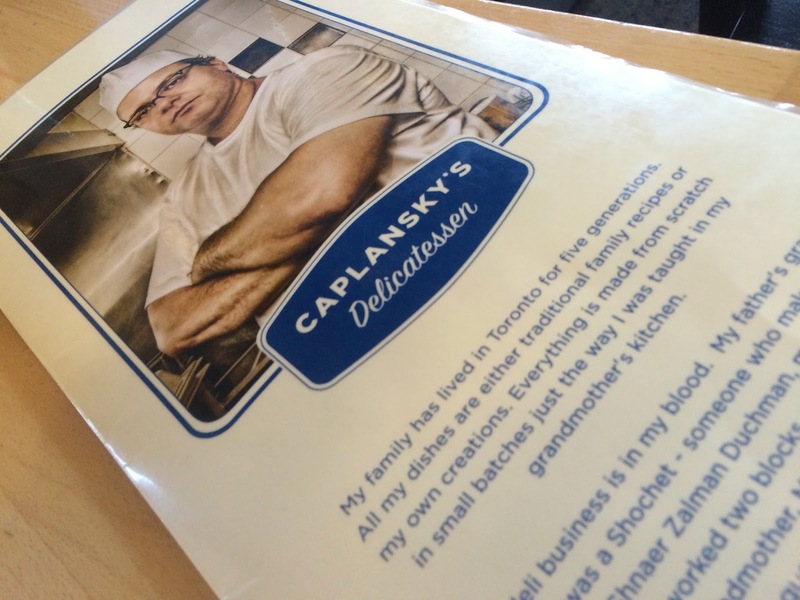 Caplansky's smoked brisket is lovingly handmade in the deli and that's a huge plus. While it clearly can't compare to the best Montreal smoked meat, it is still a really excellent artisanal beef brisket sandwich. As good as Caplansky's was, it still fell short of the mark, at least as far as my quest was concerned. 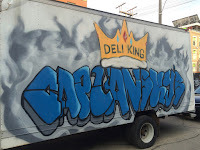 The thing is that I was now close to the end of my short list of likely candidates, facing the real prospect there was no such thing as good Montreal smoked meat in all of greater Toronto. Any remaing hope I may have entertained at this point dimmed even further when I learned that Dunn's had closed its only outpost in Toronto. I had pinned high hopes on Dunn's because they are one of the few places for really good smoked meat in Montreal. I had put Dunn's last on my list because I really thought that they would be the one. As bleak as the foodie quest looked to be please take heart. If all you expats were pinning your hopes on my quest, betting against all odds that I would finally exclaim, like a classical Greek adventurer, "Eureka!!" 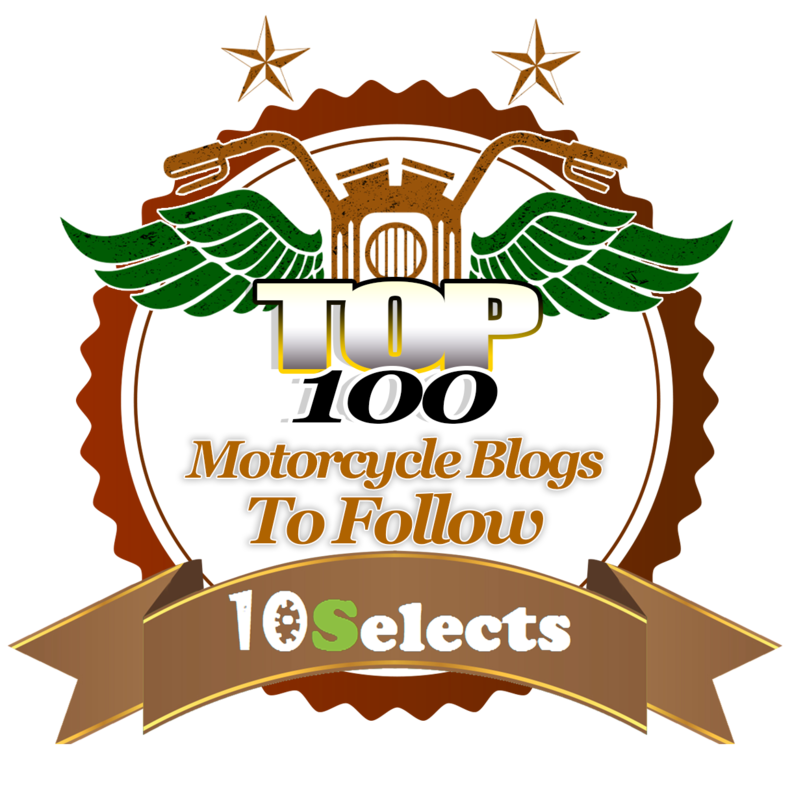 you are in luck after all, because... finally, after months of suspense, trial and error, now I say it. "Eureka!!" I wish I could honestly say to you that I found it. Alas I can't. That's because Karen pointed me to the secret source early on. In fairness though, Karen had suggested that there was really good pastrami to be had there, not smoked meat. Now I like pastrami, I like pastrami a lot, but pastrami is New York City's claim to fame, not Toronto's. If really good Montreal smoked meat is so elusive in Toronto, why would really good pastrami fare any better? 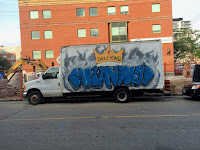 I know that Torontonians like to think of Toronto as akin to New York, but c'mon, really? Have you been to New York?? It was in that more or less gloomy frame of mind that I set my sights Karen's suggestion, and on what I expected to be my last attempt to find nirvana: Katz's Deli. I figured that if Karen was right, and Katz's Deli really did serve truly mouth-watering pastrami, it might well turn out to be the silver lining in my cloud of brisket gloom. 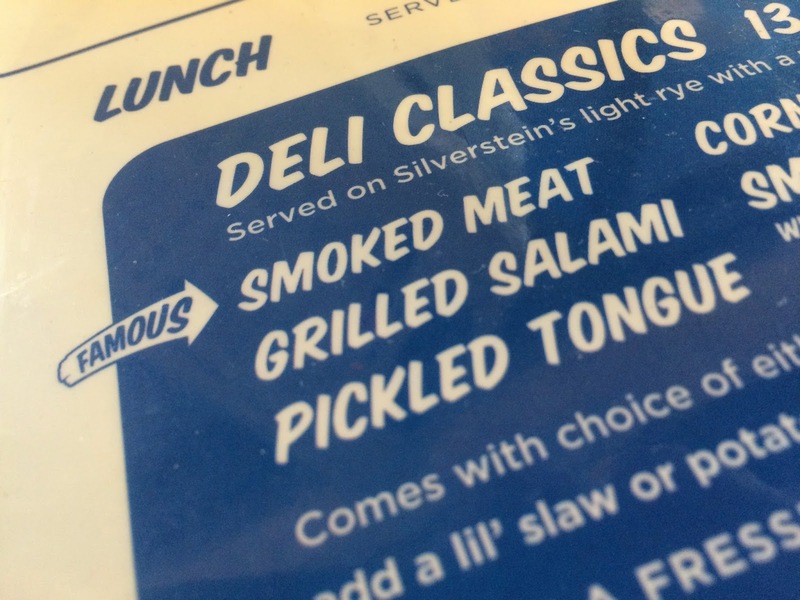 I could be consoled by really good pastrami, truly, I could. I wanted to be consoled! 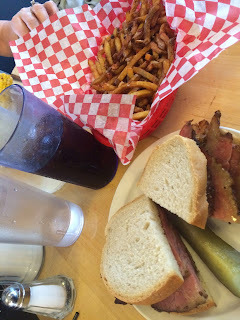 In truth Katz's blows its horn for having legendary corned beef, not pastrami, or smoked meat, even though they feature all three brisket-based offerings on their menu. That they might have crave-worthy corned beef could well be the gospel truth. But I don't know much about corned beef. It's just not something I crave. Why swear by your corned beef and not croon about your pastrami? It might mean that you know your pastrami is, well, not as praise-worthy as your corned beef. No? There was that, and this: No Montreal deli worth it's reputation slices smoked meat other than by hand. It's an art, an essential part of preparing and presenting a smoked meat sandwich just the right way. Katz's uses automated meat slicers, like those you find at the grocery store. Not a good sign, really not a good sign. That said, if I can't have Montreal smoked meat, I'll take really good pastrami any day. So that's what I ordered for lunch. Karen promised it was really good. I was prepared mentally to forgive the meat slicers. YUP!!!! SLURPPP!! OH YEAH!! HALLELUJAH BROTHER!!!! EUREKA!! I finally got my brisket fix in Toronto, even if it was pastrami, not smoked meat. That pastrami sandwich was for me, heaven. It had everything a truly great pastrami sandwich should have. Thinly sliced juicy flavorful brisket with that great pastrami flavoring; tender, suitably laced with a little luscious lip-smacking fat, definitely not too salty, stacked expertly, and dangerously high between fresh rye bread, with a crunch in the crust, and a smear of yellow mustard; just pure unadulterated foodie joy and jubilation. I forgot all about the meat slicers on the spot. The truth is that I was deeply comforted that I now knew where to get really really good brisket sandwiches in Toronto. But wait... it gets better. A little later on, I went back to Katz's Deli with Susan. Susan ordered the 'Montreal smoked meat', and I ordered the corned beef. That's a measure of how skeptical, how pessimistic I had become. 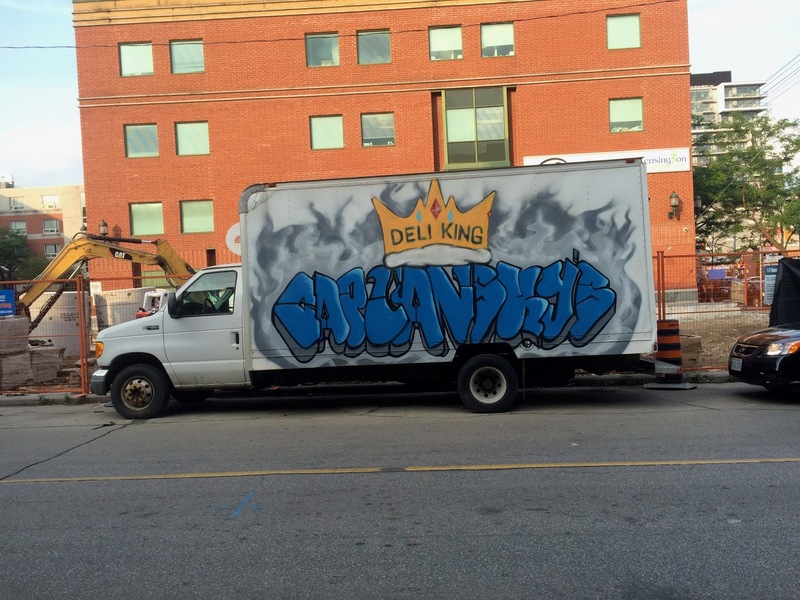 I wasn't even in the mood to try anyone's smoked meat in Toronto anymore. I had so shifted gears that I figured I would even try to become a fan of corned beef. I knew that I had found pastrami heaven and that was success enough, what if their corned beef claim was justified and I became a corned beef convert? Then I'd have a place to go for two, two, TWO, TWO!! crave-worthy brisket treats! Was the corned beef all it was cracked up to be? YESSSSSIRRREEE!!! What a revelation that was. But wait... IT GETS EVEN BETTER!!! I thought I'd never, ever, ever, write this... but... Katz's Deli has really, really, really good Montreal smoked meat too!! IT'S A TRIFECTA OF BRISKET JOY! Karen I will never, ever doubt you again. Katz's Deli surpassed their reputation. Is that a offshoot of the famed Katz's Deli in NYC? If so, then the meat is mostly likely shipped there from New York. However I am not sure if that's even possible because Canada is another country and not the 51st state like many Americans think it is. Sorry folks, a slip of the hyperlinking finger. Got that fixed now. Hopefully Katz's will forgive the momentary indiscretion (not that they are paying for the review). Rob it could be possible. After all, we have Nortdstrom's and Saks Fifth Avenue here, so why not a New York deli, right? Happy yes, though I may have given the impression that smoked meat is way too important to me. Thanks for catching the glitch Ed, much appreciated. CRS moment, did I mention http://adamsonbarbecue.com/ opened across the street? Tasty, but out of my snack bracket to be a regular thing. When you called out "EUREKA" I knew right away that it had something to do with the satisfaction of culinary desires. Good you found what you were looking for, David. You sound really happy. Sonja, I am generally a happy person, though many think that I am too serious. 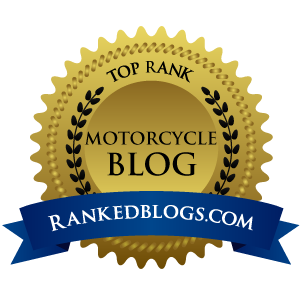 We're going through a rough patch as we transition into full blown retirement. But that too shall pass. Thanks for your cheery words of encouragement. Much appreciated. Ed, you don't want these things too close by. !0K is about right. If I only ran there to eat, it would mean a) less health risk, and b) less frequent, and c) I'd arrive in much better shape. On the downside I'd be ravenous when I got there. Ah, you make me smile. Dad would be proud. I know I am!